Need help with your brag sheet for letters of recommendation? Enroll in our college application boot camp to get the counseling and advising you need. So, what is a brag sheet? Why is it so important? Completing your college applications is a big step for any high school student. You’ve spent hours poring over every section. You’ve written and rewritten the perfect personal essay. You are finally ready to finish the application and get it to the admissions committee. 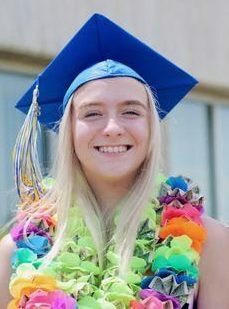 But before you can count the application as complete, you may have to get letters of recommendation from adults who can speak to your abilities, character, and work ethic. What can you do to help your teachers, coaches, and mentors showcase your very best talents? This is where a brag sheet is so helpful, both for the recommender and you. As the applicant, you will highlight the best qualities in your application—your top grades, teamwork as a 4-year athlete, and all of the community service that you’ve completed. It’s only natural that you say great things when you are trying to sell yourself to an admissions committee. After all, if you don’t think that you are a great applicant, why should they? But colleges want to know that you are providing an honest assessment of your abilities. This is why recommendation letters can help them better understand where you shine. They provide a personal view of who you are beyond just the standard metrics (grades, test scores, list of activities) that the rest of the application includes. When you submit your application to a college admissions board, they review the paperwork and decide if you are a good fit for the school. Letters of recommendation give people the chance to “speak” on your behalf. Letters from recommenders can also provide another perspective on a challenge you may have faced and overcome. A teacher who saw you come in for extra tutoring to improve after a bad test can talk about your work ethic. A coach who worked with you to get back on the court after an injury can tell an admissions committee about your grit. These are all things you will want to highlight, especially if there is a section on your application that doesn’t truly demonstrate your abilities, such as a dip in grades or performance. What do colleges look for in a recommendation letter? Letters of recommendation are pretty standard in the college application process and almost all schools ask for them. Most ask for 2 or 3 letters of recommendation written by people who know you well. There are a few things that schools look for across the board. Personal stories and insight: A letter of recommendation is the perfect place for your application to get more personal. In the other sections, you provide your grades, test scores, and a good picture of you are as a student. But the recommendation letter (in addition to your personal essay) is where you can show who you are as a person. A great letter of recommendation goes beyond just listing your good qualities or achievements. It gets more into your personality and passions. Written by someone who knows you: The most important thing to remember when considering whom to ask for a letter of recommendation is to choose someone who knows you. Recommendations are personal accounts of who you are—your character, personality, dreams, and goals. If your recommender doesn’t know these things, they won’t be able to write a very good letter about you. You may have a distant connection to a famous or prestigious person in the field you want to study, but that doesn’t mean that they will make a good recommender. You are better off getting a letter of recommendation from a teacher or coach that you have worked with and can write genuinely about your abilities. Specific examples: A letter of recommendation that goes on and on about how great and talented you are only does half the job. A great letter of recommendation should include specific examples of your greatness and talents. Writing an anecdote about how you gave up your Saturday mornings all school year to tutor kids in the grade below you paints a more vivid picture than just saying that you help other students. This is another reason why people who know you and can provide those specific examples should write recommendation letters. In-line with the school’s mission: It’s helpful to do a little bit of research into the mission of the college that you want to attend. Do they have a particular focus on community service? If so, getting a letter of recommendation from a teacher who saw you study hard all semester is good, but providing one from the leader of a mission trip that you participated in may do a better job of showing how you are a good fit for this particular school. A cohesive picture of you as an applicant: Consider what goals you have stated in the rest of your application. If you aspire to be a great novelist, including a recommendation letter from an English teacher who has become your mentor highlights the steps you have taken to pursue that goal. If you want to work to preserve endangered species as a scientist, ask the volunteer coordinator that you worked with to write your letter. Whatever your goals are, your recommenders can be great people to write about what you are currently doing to pursue them and how you will continue to do so as a college student. They are usually professionals working in that field as well; getting their vote of confidence in your ability to join them in that field can go a long way. How do brag sheets help recommendation letters? Brag sheets act as summaries for recommenders. Like all of us, recommenders are busy people. They may be writing letters for multiple students during application season. You can help them craft the very best recommendation possible by providing them with the relevant details. Brag sheets are not substitutes for letters of recommendation. Rather, they serve as a reminder for recommenders on what you have accomplished, what your goals are, and how you have worked or studied with them in the past. Some schools have started asking for brag sheets, similar to a job asking for a resume. You should make sure that your brag sheet looks professional and puts your best foot forward. Much of the information on your brag sheet will be included in other parts of your application, so take the extra step to make sure that it is accurate and up-to-date. This helps both your recommenders and any schools to which you submit it as part of your application. What should I put in a brag sheet? Each student’s brag sheet will be unique to them, but there are a few things that are helpful for everyone to include. How is a brag sheet formatted? How do I make it look nice? A brag sheet should look professional and neat. Check your brag sheet for spelling and grammar errors. Nothing says “don’t pick me” like misspelling a simple word (or worse, your own name!). Run your brag sheet through a spell check program and have another person take a look to make sure it all makes sense. Use a simple font and size. Size 12 Times New Roman is the most widely-used font for resumes, curriculum vitaes, and brag sheets. If you need to differentiate certain headings, simply bold or indent to create that distinction. Cutesy fonts and big or small sizes should be avoided. The same goes for colored text and pictures. Aim for one page. It is a general rule of thumb to keep professional summaries of your experience to one page. Even professionals with decades of experience highlight only what can fit on a single page. Why? Because more than that can be hard to read and those reading it may worry that you are simply padding your resume with experiences that aren’t actually relevant to who you are. Include the most important things that highlight your experience, abilities, personality, and goals. If they need more information, they can reach out using the contact information you included on the top. Your school may have a specific format for brag sheets. Check with your guidance counselor’s office to see if they have any standard format that teachers and coaches at your school are used to seeing. 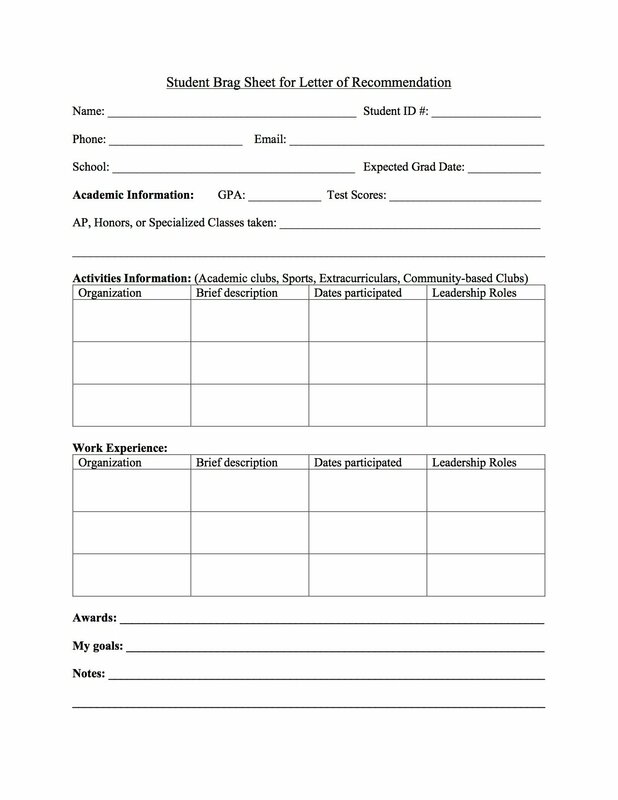 You can also use this template to provide the basic information needed for a recommendation letter. When should I write a brag sheet? You should start your brag sheet as soon as possible. Once you start participating in activities or winning awards, keep all of this information in a binder or folder. This will keep you from forgetting the details of the experience and make your brag sheet more specific. Relevant information and accomplishments help recommenders include this information in their letters, which paints a clearer picture of you to an admissions committee. Everyone benefits! Keep in mind that a brag sheet is an ever-changing document. You will need to update it as you add clubs, awards, work experience, and other things to your life. It helps to sit down periodically to make any changes needed. This can prevent you from having to perform a major rewrite when it comes time to send the document out. What else should I give to a recommender? It should be a given, but always ask your potential recommenders if they would be willing to write your letter of recommendation before you provide their information on your application. This is best done in person and conveys respect for them. It also gives them the opportunity to gracefully decline if they don’t feel they have the time or insight to write the letter that you need. You should ask recommenders well in advance of any deadlines so that they have time to actually write a great letter. I always recommend that you provide the admissions guidelines for the schools to which you are applying to anyone involved in crafting your application. This includes those individuals writing your letters of recommendation. Chances are if you have a strong history with them and they have agreed to write your recommendation letter, they want to help you reach your goals. They will appreciate all of the information that you can provide. If the school is looking for something in particular, such as your leadership potential, ask your recommender to include an example of when you were a great leader. You can also share the school’s mission to help them better understand what they value in a potential student and what should be highlighted in their letter about you. Recommenders also appreciate knowing the logistical details of the letter-writing process. Will they be sent an electronic link? Will they need to upload it to an electronic portal? All of these details will help them know exactly what is expected of them as a recommender and when. We’ve created a brag sheet template for you. Feel free to adjust the categories, make them longer, or add spaces. You can also look at the image below! A letter of recommendation is an important part of your overall college applications. It is also one of the few pieces that you do not provide. Brag sheets can be a great way for you as the applicant to make things easy and straightforward for your recommenders. A comprehensive and accurate brag sheet can help a recommender craft a letter that shows who you are as a person, is specific and relevant to what you want to do, and will help you get into the school of your dreams.